When I wrote about the New York Times Reader, about a year ago, it was an interesting concept. It is a news reader based on WPF, it looks really good but it also has it shares of problems. One being that it only displays news from the New York Times (I don't want to start a new program for each type of news I want to read). Back then it was also free, but now it seems that New York Times has become greedy. I just received the following message telling me that I have to pay $165 to continue using it. This note is to let you know that the beta period will be ending in two weeks. Times Reader will launch as a subscription service on March 27. It will cost $14.95 a month or $165 a year and will include access to TimesSelect and Premium Crosswords. Times Reader will be free to home delivery subscribers, including 7-day, weekend, Sunday only, weekday only, Book Review only, Large Type Weekly subscribers, and those who receive the special education rate. ohh... and did I mention that it has advertisements everywhere? I know that news companies are struggling to earn money in this internet era, but I do not think this is the solution. 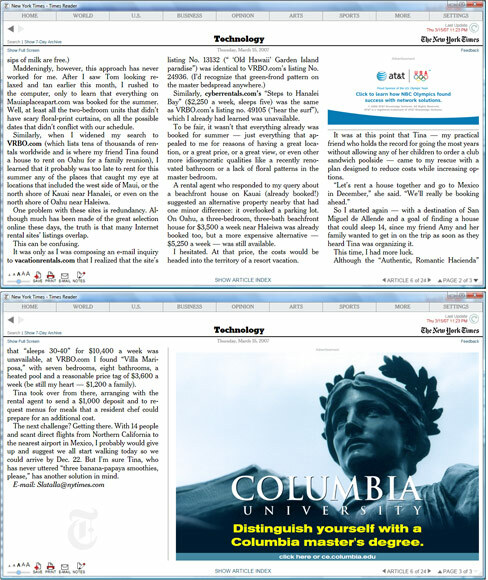 New York Times Reader was the first real application to showcase WPF's ability to create smart layout. Something we could learn a lot about when building things on the web. It is not perfect, but it is much better than what most web developers do when they make "fluid" layouts. There is a destructive culture in the media where we keep doing little things that get in the way of converting people to valuable readers. What is the deal with the EU snippet tax and copyright regulation? The future of smart homes and voice assistants ... from 40 years ago. After the presidential election, we said we would change how we cover elections. But are we? Traditional publishers often blame the format when the problem is really with the content. GDPR is about much more than updating your privacy policies. The media and tech world approach the world from opposite directions. We are Missing the Point about Facebook, Cambridge Analytica, etc. We won't solve the problem with political corruption by regulating Facebook. A quick explanation about all that is new with the 2018 edition of Baekdal Plus.